Over the last two decades, hummus has evolved from a mezze at Middle Eastern and Mediterranean restaurants to the hottest, most nutritious dip and spread at supermarkets nationwide. It’s the darling of nutritionists, nutritious and versatile, and a better-for-you snack. It also is welcome to vegans, kosher consumers and the lactose intolerant. Hummus is a thick paste that originated in the Middle East (see the history below). The classic recipe has two main ingredients, ground chickpeas (garbanzo beans) and tahini, a paste of toasted sesame seeds; along with olive oil, lemon and garlic. The word hummus is Arabic, meaning chickpeas. The full name of the spread is hummus bi tahina, chickpeas with tahini. 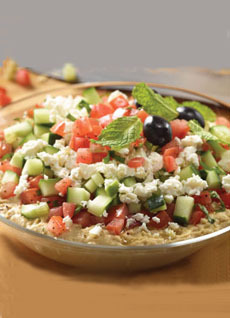 WAVE 1: HUMMUS EXPANDS IN THE U.S.
Americans, most of whom first discovered hummus served with pita, a Middle Eastern flatbread, turned it into a general dip for crudités and tortilla chips, and a sandwich spread. If you didn’t order it at a restaurant or live near a neighborhood with an international market that carried it, you made your own hummus: the recipe couldn’t be easier. As American cooks have riffed on the original recipe, hummus first became flavored. New ones seem to appear monthly to keep customers interested, often as limited editions which may then become permanent parts of the line. First there were Middle-Eastern-related flavors: Artichoke, Garlic, Red Pepper, Spinach, Za’atar (and other spices). Then, the door opened: Beet, Caramelized Onion, Carrot, Cucumber, Everything (like an “everything” bagel), Horseradish, Sundried tomato,Lemon Rosemary Red Pepper, Sweet Roasted Red Peppers, Vine Ripened Tomato & Basil and Zesty Spice & Garlic, among others. Fusion flavors include Cilantro, Chimichurri, Edamame, Guacamole, Kalamata Olive, Lemongrass Chili, Pumpkin, Ranch, Sriracha/Thai Chili. The lesson is: If you like a particular flavor, try stirring it into hummus. 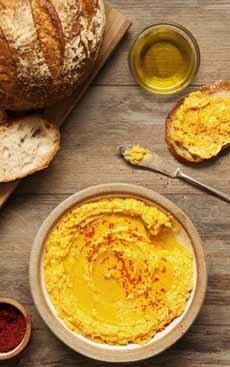 The sophisticated flavors of these “other bean hummus” varieties, all part of the Mediterranean Diet, provide wonderful alternatives to classic hummus. Like chickpeas, beans and legumes contribute protein, fiber and healthy (monounsaturated) fat, low in sodium and cholesterol free. Another innovation was to add Greek yogurt to classic chickpea hummus. It lowers the fat by 50% and the calories by 33%. Other brands followed suit, and now these variations can be found in markets nationwide. Restaurant chefs, as well, have been contributing to the variety. The King & Duke restaurant in Atlanta serves a White Bean and Rosemary Hummus with toasted pita chips. E+O Food and Drink, in Mount Prospect, Illinois, makes Smoked Pea Hummus served with fried cauliflower and toasted almonds. Hummus fever has engendered the preparation of other purées. Young Joni pizzeria in Minneapolis serves a purée of cauliflower, topped with shishito peppers, saffron chermoula, pickled Fresno chiles, golden raisins and almond picada. El Five in Denver makes golden beet-yogurt purée, popularly served with Chicken Kofta. So lesson #2: Don’t hesitate to make hummus with other legumes—including a mix of legumes. And adapt the concept to turning puréed vegetables into dips and spreads. You can also use flavored olive oil instead of plain; add another layer of flavor with nut oil (almond, hazelnut, walnut, etc.). Beyond snacking with vegetables or chips, you can use hummus in every meal of the day. Use it in its paste form, or dilute it into a sauce with olive oil. Breakfast: Spread it on toast. Lunch: Add it to vinaigrette, use it as a sandwich spread. Dinner: Make a sauce for grains and vegetables, top a baked potato, use it instead of pizza sauce for a Middle Eastern pizza. Chickpeas, sesame, lemon, and garlic have been eaten in the Levant† for millennia. Though widely consumed, chickpeas were cooked in stews and other hot dishes. Puréed chickpeas eaten cold with tahini do not appear before the Abbasid period (750 to 1517 C.E.) in Egypt and the Levant†. The earliest known recipes for a dish similar to hummus are in 13th-century cookbooks from Cairo. Some food historians believe the paste appeared a century earlier, prepared by Saladin, the first sultan of the Ayyubid dynasty (1174–1193). If so, it was more likely created by a cook in his kitchen, the idea of the warlord Saladin-as-cook being tough to swallow. Recipes for cold purée of chickpeas without tahini, but with vinegar, oil, pickled lemons, herbs and spices—but no garlic—appear in medieval cookbooks; as do recipes with nuts vinegar (though not lemon), with many spices and herbs. Whomever and however, we’re grateful that it came to be part of our [almost] daily diet. 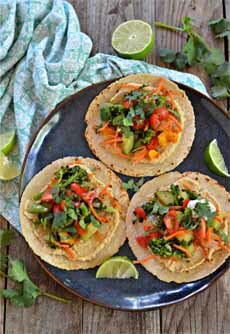 Hummus tacos. Here’s the recipe, along with hummus nachos, from Mountain Mama Cooks. 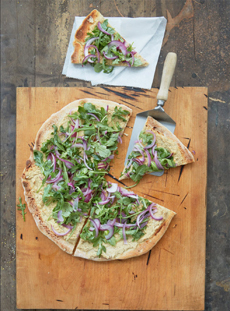 New uses for hummus: hummus pizza (photo courtesy The Purple Carrot plant-based meal delivery). 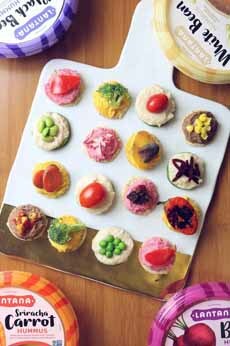 Hummus canapés a.k.a. “bites” (photo courtesy Lantana Hummus). Hummus salad. Here’s the recipe from Zoe’s Kitchen. Hummus sushi with bell pepper and cucumber. Here’s how to make your own. 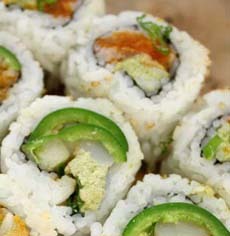 (photo courtesy Genji Sushi). 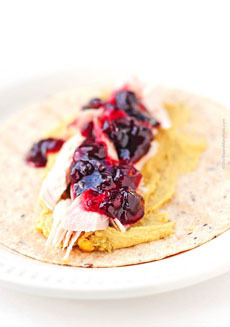 Turkey cranberry sauce wrap with hummus (photo courtesy She Wears Many Hats). * The term pulse is used for crops harvested solely for the dry seed, such as lentils; as opposed to green peas, which are eaten fresh like vegetable crops, and can be eaten in younger forms, e.g. pea shoots.